Our engaging and interactive training programs are customized to support you in realizing your organization's specific goals. Our foundational topics center on the Four Distinctions of Leadership: Emotional Intelligence, Change Management, Team Building, and Communications. Our additional topics: Unconscious Bias, Diversity, Time Management, Meeting Management, Project Management, Conflict Resolution, Generational Differences, Personality Assessments (DISC, MBTI, Kolbe, etc. ), Dealing with Difficult People, Business Writing, Strategic Planning, Managing Virtual Teams, The Trust Factor, Body Language Basics, Knowledge Management, Managing Office Politics, and more. 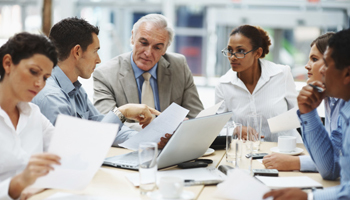 Our Executive Coaching Programs give your executives and managers the competitive edge. This allows your organization to achieve important goals, objectives, KPI's, and other key metrics. What you don't know can hurt you. Our programs include regular meetings with a certified and experienced coach, centered around specific goals. We then surface the root cause of challenges and road blocks. From there we create a clear blue print for success, that will guide each coaching session. At all times the client is in the driver's seat, always able to adjust course to meet immediate and time sensitive coaching needs. We find that once clients discover what lies in their blind spot, success becomes much easier. Do you need your team on the same page? Do you want to resolve subjects where there are differences of opinions? Our Meeting Facilitation Services focus on supporting your executives, managers, or team members in achieving a specific and aligned outcome. Example Meeting Facilitation outcomes include: Establishing Our Vision and Mission Statement, Setting Clear Goals and Objectives, Strategic Planning, Project Planning, Issue Resolution, Process Improvement, Process Re-engineering, Procedure Design, etc. Our trained facilitators use advanced facilitation techniques, handling personality differences, agendas, and other meeting challenges. Invite us to speak at your meeting or retreat. Our style is both engaging and content rich. We inspire your audience to see things through a new perspective and want to take immediate action to realize something new. At the same time we offer you real content and actionable techniques to take your organization to the next level. Our leadership topics are customized to your event needs. Sample topics include: The Phoenix Effect: Rising Strong in the Face of Organizational Change, Leading High Performance Teams, Great Leaders at Every Level, and more. We speak at evens both large and small.